The aim of Anatolian Journal of Psychiatry (Anadolu Psikiyatri Dergisi) is to present on a scientific level and share the theoretical information and clinical experience in the field of behavioral sciences, primarily psychiatry, and create a forum. Anatolian Journal of Psychiatry aims to reach a national and international audience and will accept submissions from authors worldwide. It gives high priority to original studies of interest to clinicians and scientists in social psychiatry and related disciplines. 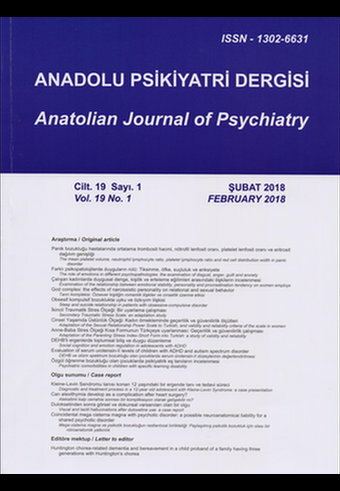 Anatolian Journal of Psychiatry publishes high quality research targeted to specialists, residents and scientists in psychiatry, psychology, neurology, pharmacology, applied and basic neurosciences, genetics, physiology, psychiatric nursing, and related sciences. Access to the Journal is available to all interested persons with no subscription fees, furthering the aim of reaching all interested national and international associations and individuals.